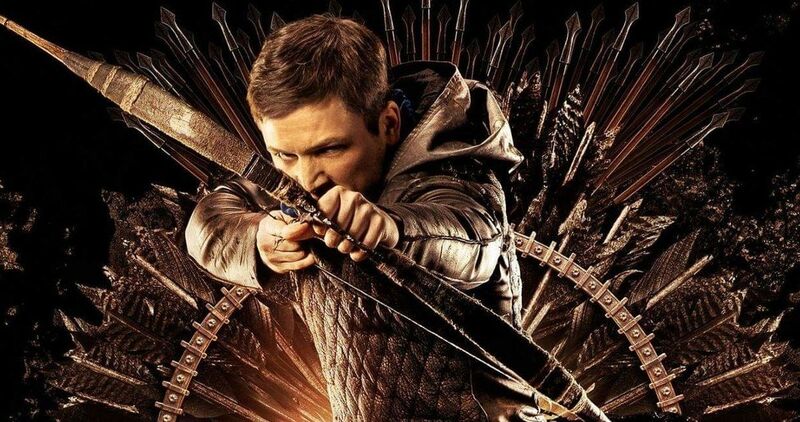 Perhaps the time wasn’t right for a new Robin Hood movie after all. From Lionsgate, the next feature film to be based on the classic character was recently released for the holiday weekend. The studio was undoubtedly hoping for a big return, given the investment of $100 million placed into the movie’s budget. With global box office totals falling well short of that at around $22 million, the film is unequivocally a bomb. That’s not even a quarter of the production costs associated with making the film, and it’s very unlikely to improve its theatrical performance moving forward either. Unless a miracle happens, Robin Hood will not even be earning its budget back in theaters, much less turn a profit. This iteration of the classic tale comes from director Otto Bathurst. To its credit, the cast is full of some amazing talent. That includes Taron Egerton as Robin Hood, Jamie Foxx as Little John, Eve Hewson as Marian, and Ben Mendelsohn as the Sheriff of Nottingham. Still, the story just didn’t seem to resonate well with viewers, and the reviews have been absolutely abysmal. The film is rated at just 13% at Rotten Tomatoes, which certainly isn’t doing any favors for the turnout. Among the critics, the consensus is that the modernized action and special effects fall flat when added to a classic story that really didn’t need it. Two other films releasing at the same time fared much better, both critically and financially. Ralph Breaks the Internet wrecked its way into earning the 2nd highest ever Thanksgiving opening, pulling in tons of positive reviews in the process. On the other side, the sequel Creed II put the pounding on the box office as well, becoming the highest ever grossing live-action film to be released on the holiday weekend. There were definitely tons of people going to the movies across the world over Thanksgiving weekend, but while they were flocking to these films, nowhere near as many were willing to check out Robin Hood. Robin of Loxley has proven to be a profitable presence on the big screen in the past, so we can’t fault Lionsgate entirely here for not predicting these results. In 1991, Kevin Costner made the character more popular than ever by starring in Robin Hood: Prince of Thieves. That film raked in nearly $400 million on a budget of less than $50 million. More recently, Russell Crowe took over the role in 2010 in a film which made over $300 million against a budget of around $200 million. Now, Robin Hood is a money loser by the millions, and after this failed run, it seems unlikely we’ll be seeing any high-budget productions of the story on the big screen for a while. Of every film made with a budget of $90 million or higher, Robin Hood is officially the lowest-performing of them all for this year. Maybe people are just getting tired of seeing this story told so many times. Or, perhaps the film’s updated action style just didn’t feel right when applied to Robin Hood. Either way, the film is 2018’s biggest bomb. This information comes to us from The Wrap.